A Step-by-Step Breakdown of His Guitar Styles and Techniques. By Yngwie Malmsteen. Arranged by Joe Charupakorn. Signature Licks Guitar. Rock. Softcover with CD. With guitar tablature. 56 pages. Published by Hal Leonard (HL.695669). ISBN 0634036831. 9x12 inches. Joe Charupakorn Guitar Signature Licks. Explore the over-the-top riffs and solos of this Swedish neoclassical/heavy metal master with our Signature Licks book/CD pack. You'll learn Yngwie's dazzling techniques via detailed study of these 12 hit tunes: Black Star • Deja Vu • Dreaming (Tell Me) • Far Beyond the Sun • Heaven Tonight • I'll See the Light Tonight • Icarus Dream Suite Opus 4 • Making Love • Marching Out • Rising Force • Trilogy Suite Op. 5 • You Don't Remember I'll Never Forget. May 14, 2003 Too thin!!! from it.. 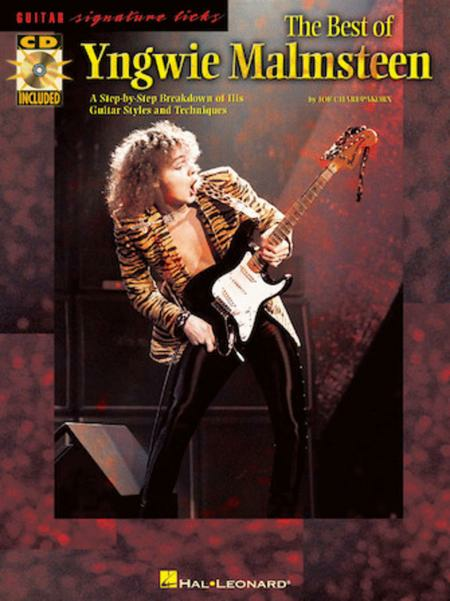 So don't buy this book if you expect complete Yngwie tabs. Only buy it if you wish to learn the parts that you can learn by ear! though) which is kind of annoying. Its a pretty good chop builder nevertheless, just hard.